The Raven Trust has been supporting evangelism in northern Malawi through the Mzuzu Evangelism Association and the Synod of Livingatonia’s Evangelism Department. The Mzuzu Evangelism Association is an ecumenical team which takes the gospel to people in the streets and outlying villages through music, drama, storytelling and sport. 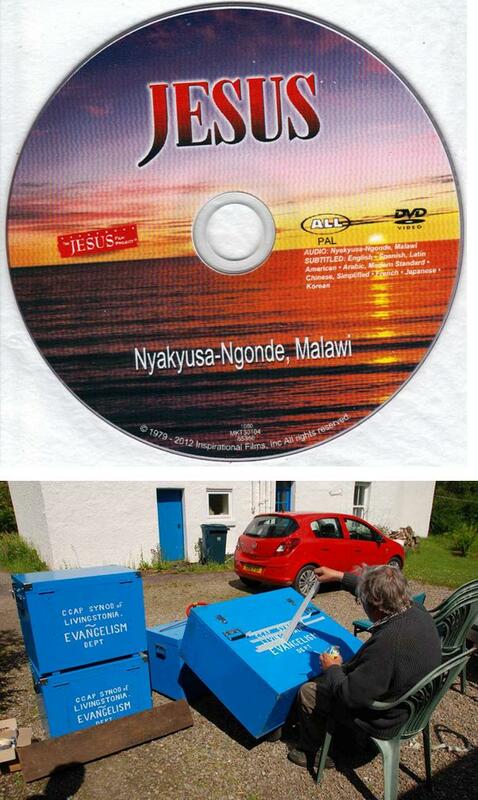 Money has been made available to purchase a DVD projector and sound system together with a 26 x 16 ft screen which will be sent to the Synod of Livingstonia Evangelism Department to enable them to show the “Jesus Film” to large audiences of up to 1,000 people. The film has been obtained in Tambuka, Tonga and Nyakyusa-Ngonde – three main languages of the people of northern Malawi. John has made stout wooden boxes to keep the equipment safe and secure and an electrical distribution panel which can be plugged into the mains and supply power to all the equipment. He was photographed last week finishing the sign writing on the equipment boxes which will be sent out to Malawi in the next container and stored in a secure place. Technicians will be trained in the setting up and use of the equipment when John is in Malawi later in the year.